Technology Access: Allows the care provider to independently access data and lab results. Patient Conferencing: The provider must be able to review x-rays and other chart data with the patient, as well as schedule upcoming appointments. 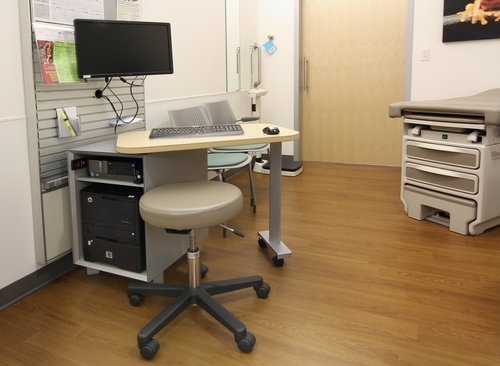 After a process of rapid prototyping and customer feedback, the final multi-functional design of the Provider Table features a cabinet designed to hold the CPUs and printers that support the technology needs of the exam room. To accommodate conferencing as well as blood work, the table features a unique slide-and-pivot action, which allows just the right position to be achieved for both staff and patients. The Provider Table is a versatile, high-value solution designed in alignment with The Everett Clinic’s project goals and is now working for other clinics throughout the country. It is also the product of Watson’s unique, collaborative approach to customized client solutions -- a process characterized by rapid prototyping and the careful evaluation of client and project needs. If you have an upcoming project that might benefit from our Studio design process, contact the Watson representative in your area to start the conversation.